Design of AHU of the capsules department is made as to maintain the RH between 35-40 and temperature 22°+/-1%. Air supplied to Capsules department section is filtered through 10µ filter and 5µ filter and terminal HEPA filter of .3 µ to achieve class 10000. Class 10000 is comprises of air changes of 30 and particle count for viable and non-viable and DOP test, 10% fresh air is used. Machine: High speed fully automatic capsule filling machine AF 90t Pam make is installed which gives filling output of 90000 capsules per hour. 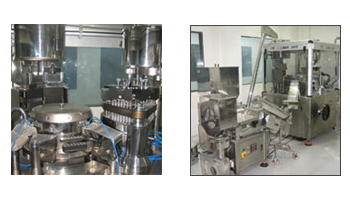 Online capsules sorting & loading of capsules for filling is done with Sorter Elevator model SE 100, also after filling of capsules sorting of empty capsules & polishing of filled capsules is done online with Empty Capsule Sorter ESC 100. Change part for capsule Size 0,1,2,4 is available.